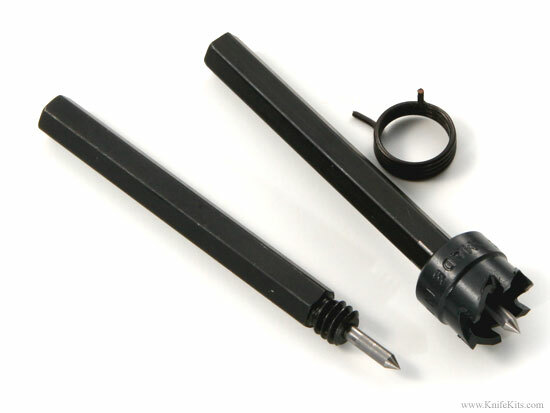 These are used for cutting the cavity needed for a coil spring pocket on an automatic or switchblade knife. For metal hole making, our cutters provide fast, accurate, burr-free holes in steel materials up to 3/16" thick. These are annular cutting tools that cut around the edge of the hole and eject the center as a slug. Because they're hollow, there's no dead zone as with twist drills. Unlike hole saws, that rip and tear through the material, they quickly give you a quality, virtually burr-free hole. Our coil spring pocket cutters are available separately in 3 sizes for 1/4" and larger drill chucks. The pocket cutter bit shown is not included with the guide. It is shown for illustrative purposes only. The bits are available here. Spring loaded replaceable arbor pilot "pops" the slug from the cutter. These are very nice.